Through out history, Islamic Art has drawn upon mathematics - the universal language of nature - for its inspiration. The geometric perfection of Islamic Architecture, the intricate symmetry found in tile and calligraphic designs all testify to this. 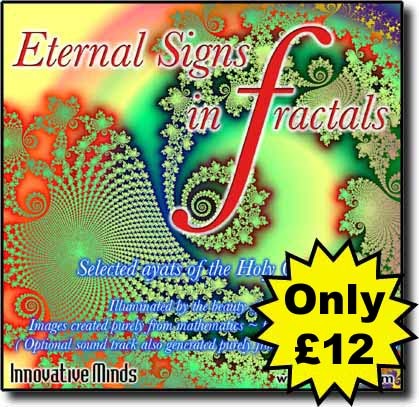 We at Innovative Minds wish to continue this tradition, and hence have choosen Fractal geometry - an exciting area of mathematics - for our inspiration for this new product. You will see beautiful fractal "paintings" illuminating selected ayats from the Holy Qur'an. All the images are amazingly created just from pure mathematics with no touching up or post processing in a paint package. The multimedia experience includes animation and sound. The sound track (which can be disabled) has also been generated mathematically from fractals! Truely a screensaver for today and tommorrow. Install it on your work pc - the beauty of the fractal images will captivate your work collegues - and the words of the Holy Quran will liberate them, inshallah. It makes a great gift to give a non-muslim friend - they will enjoy the images and at the same time, perhaps even sub-consiously, reflect upon the Divine Words. The program comes in three versions all on the same CD - versions optimized for screen resolutions 1024 x 768, 800 x 600 and 640 x 480. We recommend 24bit colour display to see the full beauty of these enchanting pictures. You will need windows 95 (or higher) and a minimum of 25Mb of free HD space (so many images ... so much beauty - they have to go somewhere!). All this for the bargin price of UKP £12. Bargain Price UKP £12.00 ! Imam Ali's Mathematical Brilliance - stories and a puzzle for you.